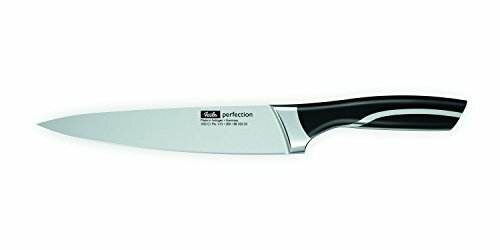 The perfect length, weight and edge for carving-the Perfection Carving Knife will make your next roast or turkey slices will look good enough to gloss the pages of your favorite culinary magazine. Fissler's line of Perfection knives were created for those who value quality and style. Distinguished by a 90 degree rotated tang and sweeping handle shape, the Perfection line has 16 knife styles, including four Asian-blades. These knives are striking and attract immediate attention in the kitchen. Made in the same tradition of quality you've come to expect from Fizzler, the Perfection knives are made of chromium molybdenum vanadium steel, which is extremely corrosion-resistant. This high-alloy steel has been hardened to an excellent degree and expertly ground. Fizzler knives, created in this way are very resistant to blunting. They are sharp, yet have the necessary elasticity along with the high rigidity needed for cutting. The perfection line has a visible, rotating tang that runs the length of the handle, creating a beautiful, sweeping line that adds sophistication and strength. All parts of the knife are joined seamlessly, so there is a smooth transition without any gaps between the handle and the bolster. Each blade and handle must also be burr-free and completely even, making them more hygienic and resistant to bacteria growth, as with other knives. The Perfection line features a fine, even surface finish. And with the high quality of workmanship, your will remain a style-statement you'll be proud of in your home for years to come. If you have any questions about this product by Fissler, contact us by completing and submitting the form below. If you are looking for a specif part number, please include it with your message.